Instead, the governor says he will ask lawmakers to pay for additional lobster research, new field technology for fisheries scientists and raises for Maine Marine Patrol officers out of the state budget surplus. ROCKPORT — Buoyed by a state budget surplus, Gov. Paul LePage announced Saturday that he longer wants to raise the price of lobster fishing licenses. Instead, LePage told lobstermen gathered at the Maine Fishermen’s Forum that he will ask state lawmakers to pay for additional lobster research, new field technology for fisheries scientists and raises for Maine Marine Patrol officers out of the surplus. The announcement was greeted by cheers and applause at the end of a morning session about possible fishing bans in the Gulf of Maine where deep-sea coral has been found. Under the proposed fee increases, a lobsterman with two deckhands would have paid $114 more a year for his license, bringing the cost of securing a license to more than $1,000 for the first time. All marine fishing licenses would have increased, but the people who make the most money, or Class III license holders who work with an additional two sternmen, would have faced the biggest increase. Commissioner Patrick Keliher of the Department of Marine Resources met with LePage on Saturday morning to discuss the budget. Keliher said LePage told him to get rid of the proposed license increase, and that the governor would look instead to use state surplus to cover the department’s $600,000 budget gap. The final decision on budgets and use of surplus rests with the Legislature, LePage noted. Keliher has already appeared before the Legislature’s marine resources and appropriations committee to defend his budget request. At the time, he said that the department had no choice but to raise the license fees if it wanted to conduct the kind of scientific research needed to protect the state’s $1.5 billion lobster industry from threats posed by rapidly warming waters in the Gulf of Maine. 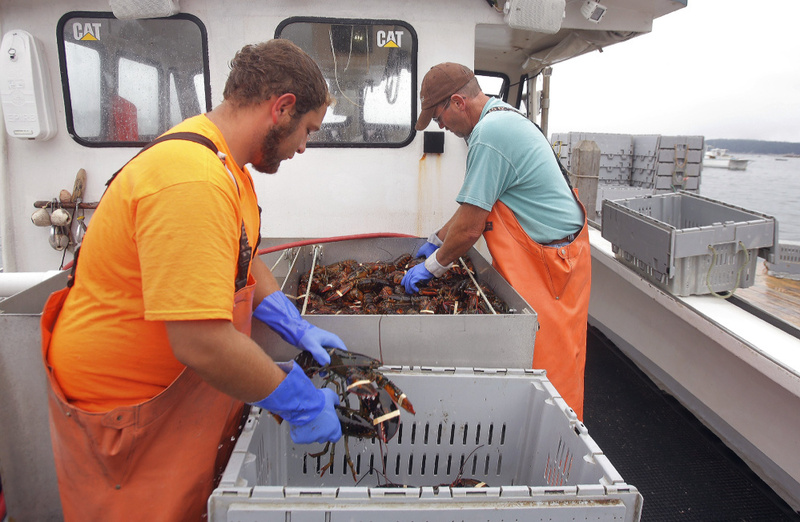 At those hearings, the Maine Lobstermen’s Association pushed lawmakers to consider funding the department’s budget increase out of the General Fund rather than the proposed license fee increases. The Maine Lobstermen’s Union urged the state to consider taking the funding out of the Maine Lobster Marketing Collaborative budget, which uses license fee revenues to build demand for lobster in the American market. The state lobster industry had a record year in 2016, landing more than 130 million pounds for the first time ever, worth a record $533.1 million, according to new state data released at the forum on Friday. But on Saturday, a group of state-funded scientists warned fishermen that the days of record landings are likely numbered. State surveys that count the youngest lobsters, which are still at least seven years from being old enough to trap, show a steep decline in numbers. The researchers said they need to do more research before they can determine if they should be ringing “alarm bells” because it’s possible the young lobsters are not settling in the same places, or at the same times or depths, as they had been previously found. Other surveys of slightly older lobsters – still too young and small to be trapped, but no longer at the larval stage – have not found the same level of decline.